The New Victoria Infirmary is on the junction of quite a few busy roads, but they have still managed to create a bit of chilling-out space. I’m not sure how relaxing it would be to sit here with all the cars and buses and whathaveyou thundering past, but it looks peaceful anyway! Now this picture I took ages and ages ago, and now I’m trying to remember where on earth it is! 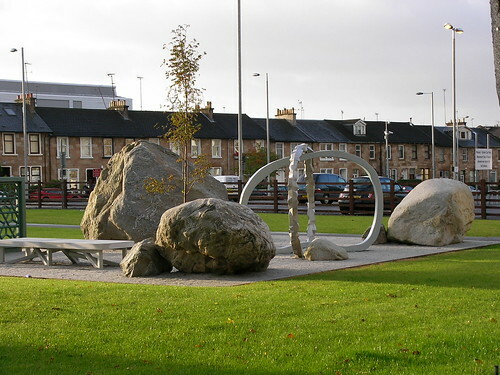 I’ve got a shortlist of two – it’s on a wall either in Renfrew Street or Ingram Street – I’m pretty sure the 66 bus goes past it anyway! It always reminds me of the pasta art we did at school when I was a kid, making patterns with the pasta stuck on paper, then spraying it silver or gold. 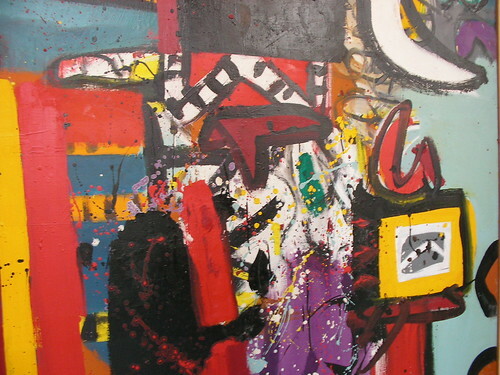 Here’s a section of another painting I really liked in the Gallery of Modern Art. 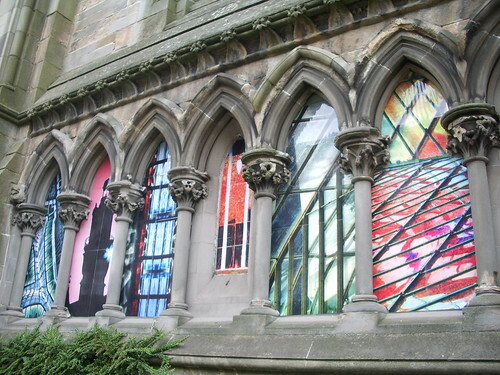 These are a few of the 13 pictures of famous Glasgow glass features currently adorning the outside of Lansdowne Parish Church on Great Western Road. 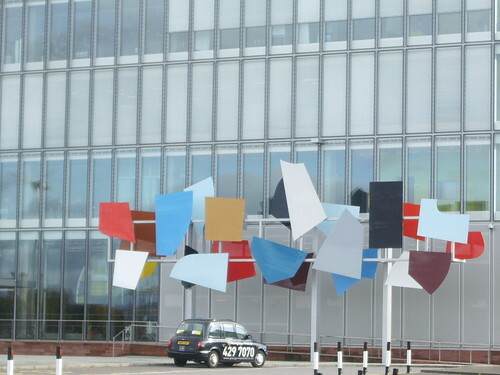 When I showed a shot of the new BBC building in Pacific Quay a couple of weeks ago, someone commented on the artwork out the front. This is a closer view of it. I like how the black cab is able to give a sense of the size of the art. 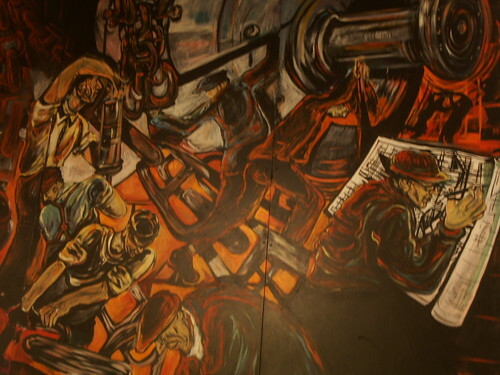 Still in the Royal Concert Hall, this is a small part of a massive frieze dedicated to Glasgow’s shipbuilding heritage. I’m sorry I don’t know who the artist is. 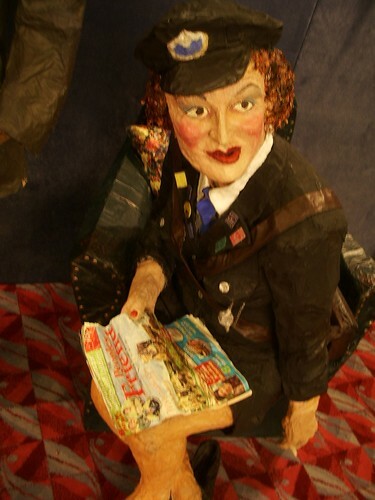 This figure shows an old-fashioned bus conductor – I loved the detail, like her reading the People’s Friend. If I remember the blurb correctly, there is some speculation that this model is based on the actress and singer Barbara Dickson who played the part in a play or something (I really hope I didn’t just make that up!). Ongoing apologies for the lack of blog visiting. I have a thesis chapter to be in on Monday and I don’t want to think about how much of it still needs writing. Argh. Thanks for stopping by though, and I’ll return your visit hopefully early next week. 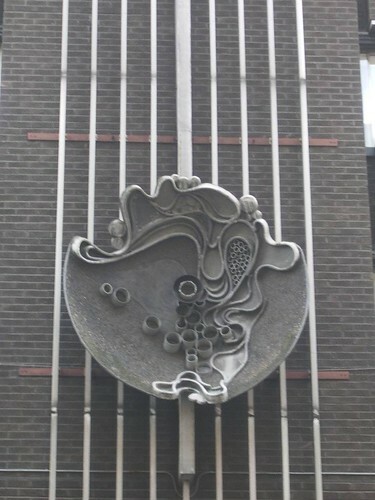 This photo is of a piece of art that was in the Royal Concert Hall (I’m not sure if it’s still there – I took this about a month ago when I was at one of the Celtic Connections concerts). 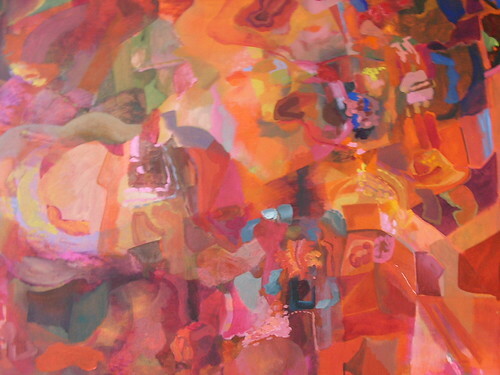 It is by an artist called Jan Miller who is based in Penicuik (south of Edinburgh). 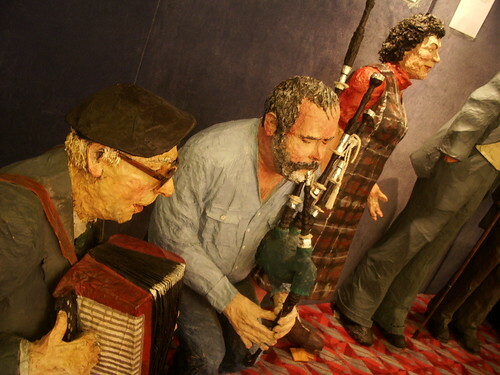 The figures are (I think) papier mache, and about 2/3 real life size, and depict real-life musicians (I wish I could remember who!). I really liked them. (I’ll show another one tomorrow).